SAVAGE HANDS Post New Video For "Unconditional"
SAVAGE HANDS deliver a very deep and emotional music video for the new track “Unconditional”, which comes off the group’s SharpTone Records debut offering Barely Alive. The EP is out now and was produced by the acclaimed Andrew Bayliss (MY ENEMIES & I, SYLAR). Check out the video now at the link below and stay tuned to https://www.facebook.com/SavageHands for all up-to-date news and future tour dates (TBA). Mike (vocals) states: “For "Unconditional", we wanted to portray an ugly side of a relationship. Something that showed a lot of anger that can be built up on both sides of a relationship. There are always two sides to every story. We wanted to catch the couple 'in the moment' and portray how anger can make you destroy everything you love and cherish in a relationship. They both destroy everything in the house, which symbolizes what they have built during their time together. Like destroying the clock for an example. The clock represents their ‘time' spent together. In the end, they both sit back to back reflecting on what they have done thinking if it was even worth all of that. We just wanted to express that we all go through these types of things and sometimes things get really ugly like that and it’s not okay. We don’t ever hope for that type of violence in any relationship. The whole mood of the song is best seen in black and white. The lyrics call for it as well. To me the video is a real life interpretation of something that I’ve actually seen. It’s sort of therapeutic to get it off my chest and out to the world for others to see and understand. SAVAGE HANDS isn’t just us, it’s the entire world. It’s the negative impact we have on each other as friends or loved ones, getting through that negative impact by whatever means necessary and learning from it. We hope that everyone can appreciate what we’ve created and we want to let everyone know we’re just getting started. We have a lifetime of problems, past and present.. to reflect on. 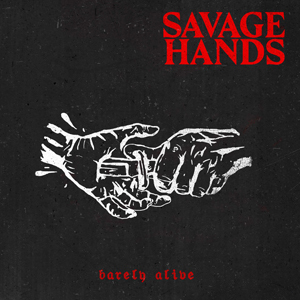 Filled with catchy hooks that weave in and out of blood-pumping, adrenaline-spiking verses and visceral, gut-busting breakdowns, SAVAGE HANDS' debut effort is one that makes the ground shake and inspires an emotional, energetic uproar within the listener. Never sacrificing a sense of poetic wit and sharp-tongued flair for their equally engaging punchy musicianship, SAVAGE HANDS' debut effort in early 2018 is just the first of many things bound to craft a stellar—and savage—future.